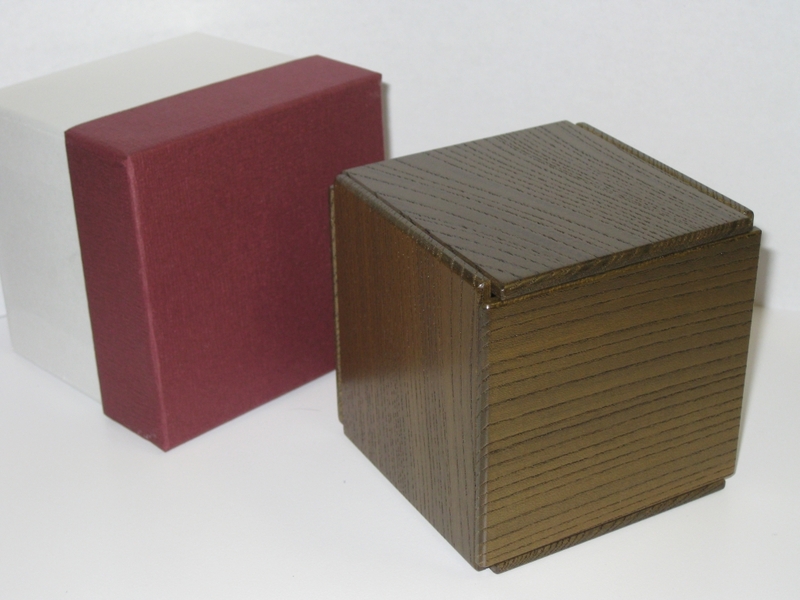 I've written in the past about the Karakuri Cube boxes, and the small box series. This latest addition to the Cube boxes comes from Hideaki Kawashima who's one of my favorite designers currently. He describes the box as a deluxe edition of the Cube series, and having enlarged the dimensions, adding a completely new mechanism, it's a box I was looking forward to playing with. As with the rest of the Cube series, the outer design should look very familiar, however each box has it's own opening mechanism, and for me is one of the charms. It's interesting to see just how many different ways to design a mechanism with the same outer structure. 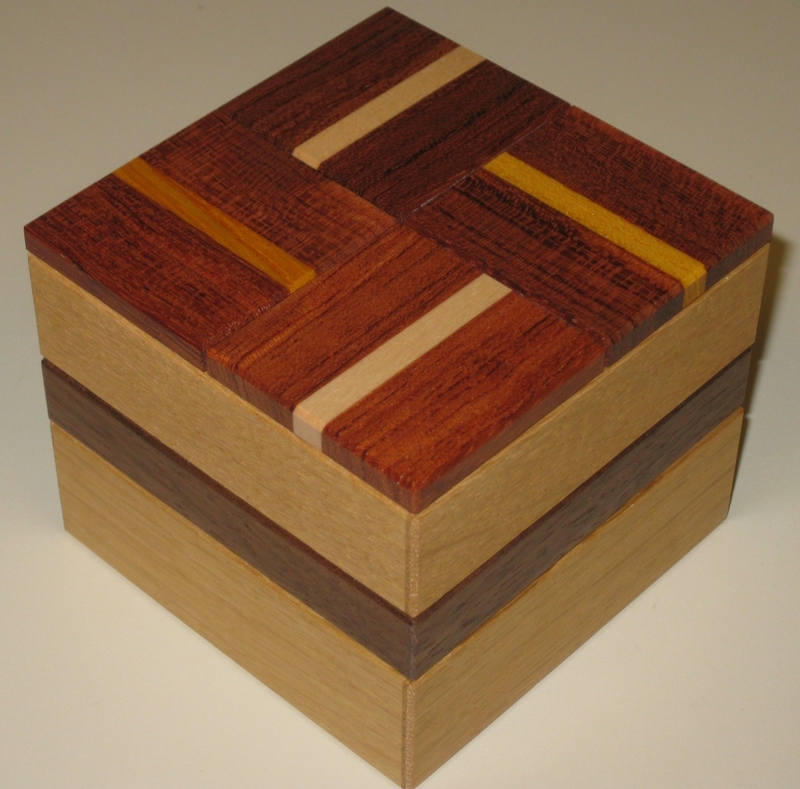 The box itself is made from Cherry, Purpleheart, and Cucumber Tree. Yes, apparently you can get enough wood from a cucumber to make into a puzzle. Ok, so it's not the plant we get the green salad vegetable from, and if you want to know more, read on. Measuring in at 2.75" x 2.75" x 2.75", it is a reasonable amount larger than the other Cube boxes, but is still a good size without being too big. 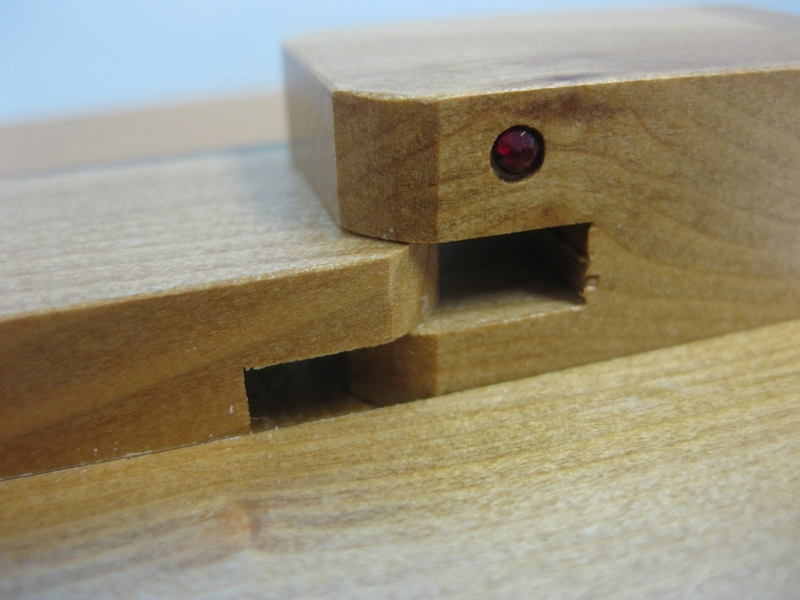 Interestingly, I'd have expected the Cherry to be the outer wood along with the Purpleheart, however Cherry is used for the inside mechanism, and is only visible once the box is open. The wonderful light white wood on the outside is the Cucumber Tree. I think I'll have to keep a look out for some of this wood myself, since it's a USA native. As a puzzle, you'll not be surprised to know that this isn't overly challenging. There's only a small number of moves to get to each of the two compartments, and while the sequence isn't massively different for each compartment, the difference is small enough that once you've opened one, you'll have no issue with the other. Kawashima's mark is found on the inside of the box once opened, and it's nice to see that the designer thought about how to arrange the two internal spaces. I've seen a number of boxes with this style of solution, where the second internal space is 'upside down' when opened, meaning anything inside would fall out, or the contents of the first space need to me removed, less you tip the contents on the floor trying to get to the second space. Overall this is a great little box, and a good simple introduction to puzzle boxes with a sensible price tag. The final puzzle I received from this year's Karakuri Christmas presents is the one I was most looking forward to. Shiro Tajima's present. Some of you may know that Tajima's boxes for the last few years have been themed around the Chinese Zodiac, with last year seeing a Dragon themed puzzle, and a rabbit the year before. The thinking was that it would be likely we'd see a snake of some form for this year following his previous entries. As you can see we weren't disappointed. "Uroboros is an ancient symbol of a serpent or dragon who eats his own tail, symbolizing self reflexivity. Although he must feel pain by doing so, he is in a constant state of recreating himself, thus the circular shape", we are told on the Karakuri information page. 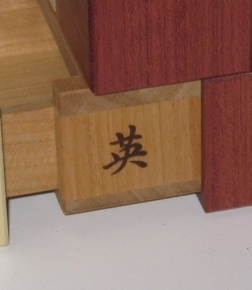 The puzzle box is perhaps the box with the most plain wood choice of all those I've reviewed so far, being made from Katsura. It is also the largest of the boxes measuring a whopping 5.5" x 4" x 2.45"
The snake wrapping around the box and eating his own tail is central to the puzzle mechanism and is well executed. 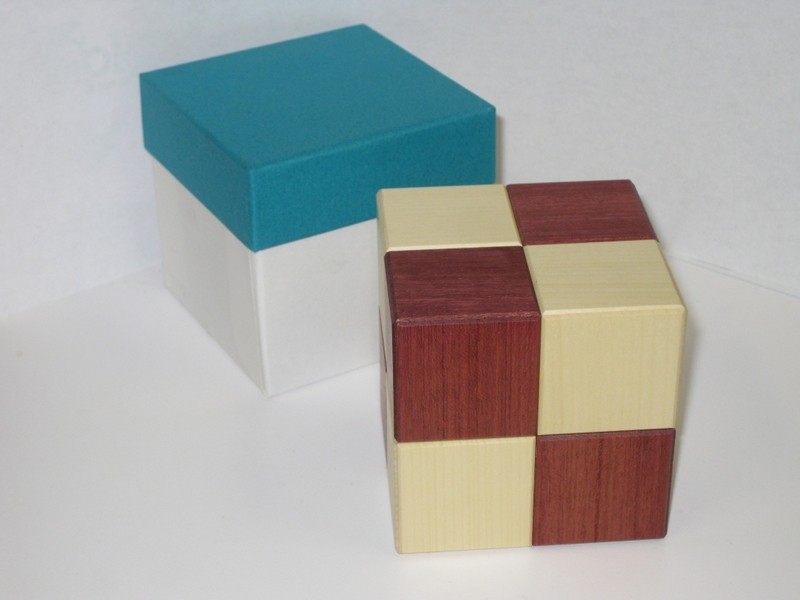 There are two compartments to be found in the puzzle, and finding the first is relatively easy. There's a lot of space in there once you get the hidden compartment open, and the size of the puzzle is directly proportional to the space inside. The second is far more challenging to find and took me a lot longer to be able to open. I do like the box despite a fairly simple exterior appearance, it has a solid mechanism, and keeps with the theme we have come to expect. Overall a really good puzzle, and I'm very glad to have it in my collection. I've already made sure that Tajima is on my craftsman list for 2013. 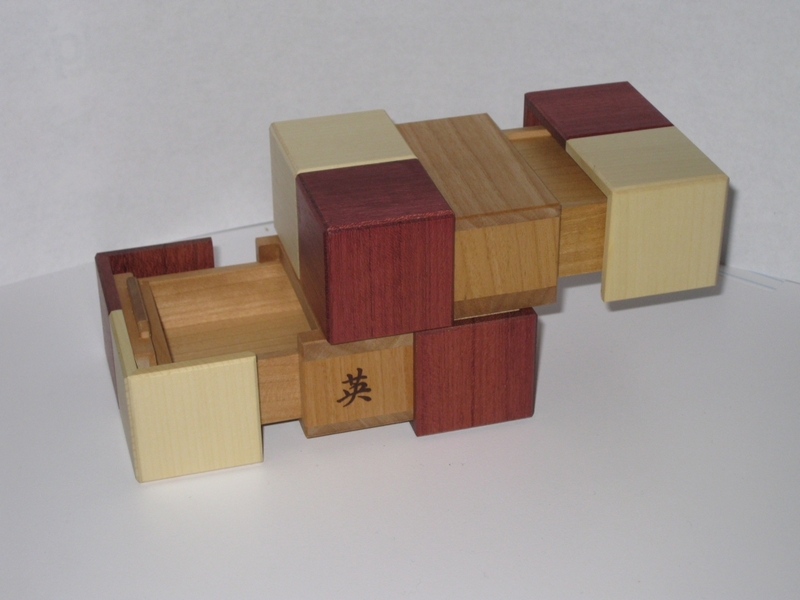 Next up from my collection of 2012 Karakuri Christmas Presents is the Half-Finished Box from Hiroshi Iwahara. Fortunately, he did finish the box, and it's just that name which isn't complete. I love the look of this box, and the wood is particularly nice. It has an almost greenish tint, which I'd normally be happy in saying is Lignum Vitae, however the wood is listed as being Shiuri Cherry. With deep strong grain and a wonderful colour I really like it. 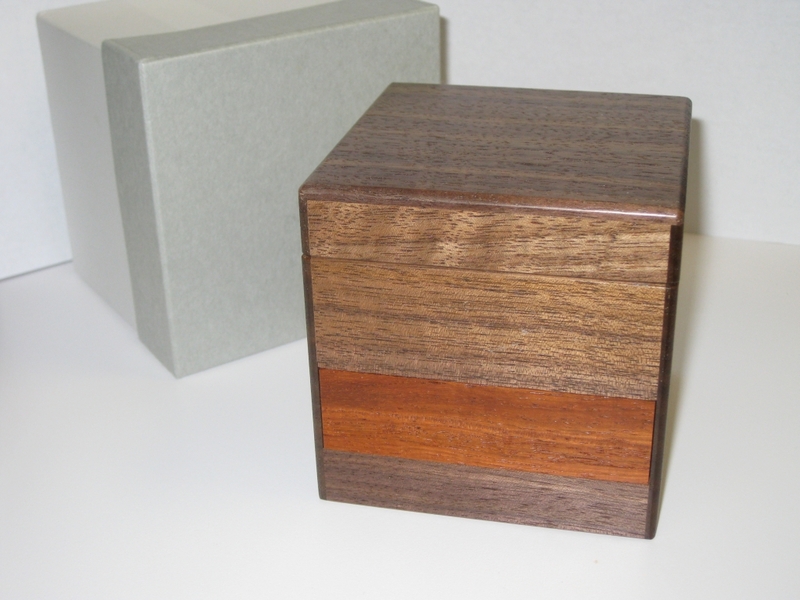 3.25" x 3.25" x 3.25" in size, the outer box is a good size, and each of the panels moves smoothly as you'd expect. Sadly this isn't a totally new work, and is something of a reproduction of his 2008 Christmas present "Confetto Box". There are two compartments to find, and finding the first marked 'A' is certainly easier to find. The mechanism has been slightly modified from the original to ensure that all 6 plates move to get to the hidden area. The Second compartment has been stamped in the centre of the recess. Sadly neither of the two hidden compartments are very large, as the mechanism takes up so much space around the central core. It's a nice box, and good mechanism. If you don't have a copy of the Confetto Box then this is a good one to pick up if you can. If you already have the box from 2008, then you may be disappointed by this one. My fourth Christmas Present was the lottery from this year which I was lucky enough to win, so added Ninomiya's Box to my collection. 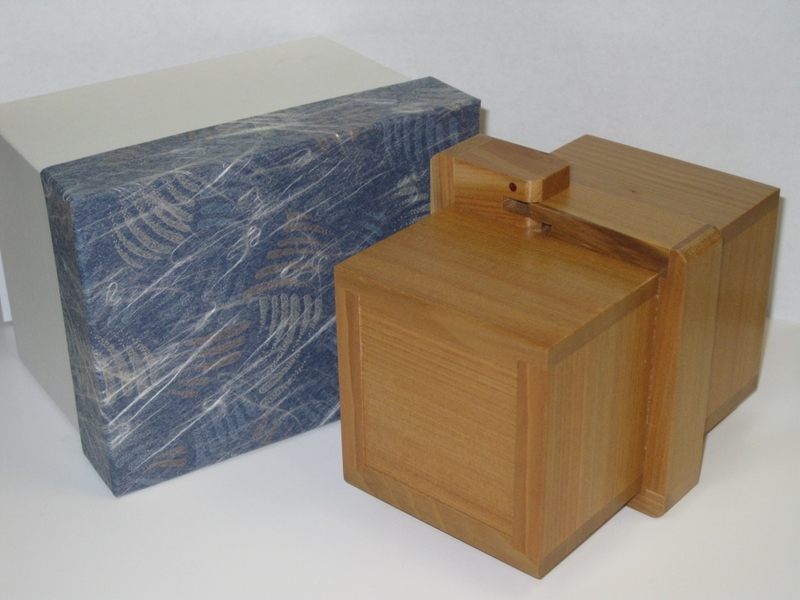 With over 60 years experience making puzzle boxes, Ninomiya's work is highly sought after, and for good reason. 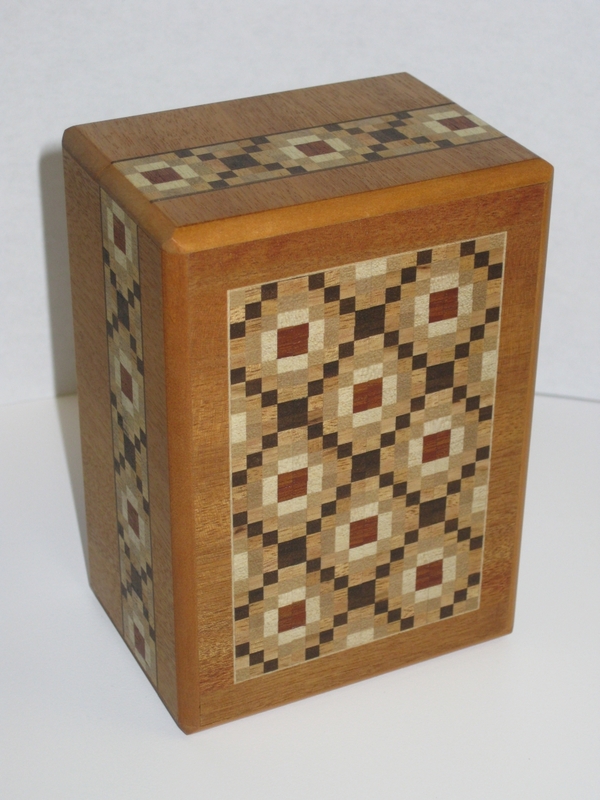 Known for his incredible Yosegi patterns, this box is a perfect example of the skill and mastery of the art. The photographs, really don't do this work justice. Not only is the Yosegi beautiful, and perfectly crafted, the fit and finish of the box is incredible. It is near impossible to see the seams between the panels, and what looks as though it could be a seam isn't! 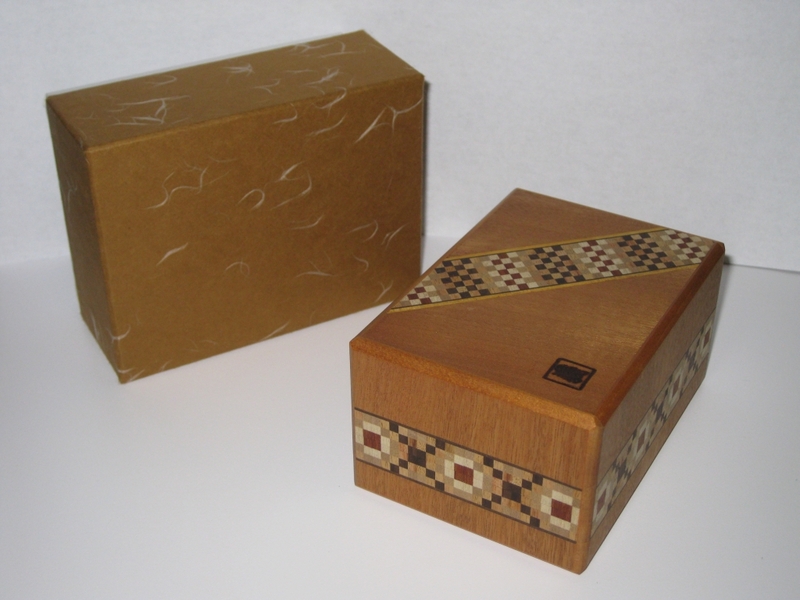 All four sides of the box are decorated with the Yosegi, as is the inside of the box. I have no idea how much time went into making this, but of all the boxes it is the most detailed and in some regards most impressive of the puzzles. Measuring 3" x 4.25" x 2.25", and made mainly from Katsura, this is a seven move box (I know you'd guessed that already right!) where both sides of the box move in the process of solving the puzzle. There is a lot more work in making a box where both sides move, and the normal is that only one will move. I was even more impressed when handing the puzzle to a friend and watching him getting stuck trying to solve it. Something I hadn't realised previously is that the sequence is keyed, and there are false paths in the 7 steps, so it game me even more respect for the work done on this box. As an overall summary which I think applies to all of this year's Christmas presents, none of the boxes are challenging from a puzzle perspective, and as such many people have commented that they are disappointing from that regard. 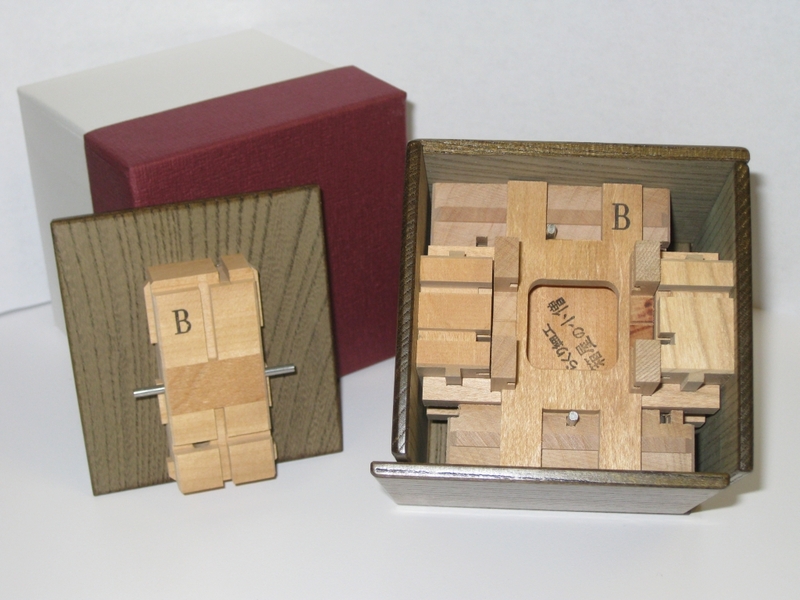 I have to agree to some extent, as there have certainly been more challenging puzzles to come from the Karakuri group, however these are not the most expensive boxes made, and are as close to 'mass produced' as you really get where the quality of craftsmanship is still so high. I was fortunate enough to win the lottery and was able to purchase Ninomiya's box, and I'm really glad I did. It's one of the stand out boxes from those I received this year. I have only one more box to review, so stay tuned for that soon. You may also be wondering why I'm including the boxes that each of the puzzles came in in my photographs. I'm not just trying to be artistic, but actually each designer has their own box style, so even before opening the puzzle box, you know who the puzzle came from. If you're a member and not familiar with the designers boxes, then maybe this will help serve as a guide for you. It's about time I got round to reviewing the 2012 Karakuri Christmas presents. I think I've left it long enough that people will have been able to play with them all and not have me spoil anything. One of the really interesting things about the membership is the Christmas present(s) and not knowing what you'll get, gut in general knowing that the boxes will be unique, and made to a very high standard. First up for this years reviews is strangely, the last box I acquired. This one popped up on one of the puzzle forums with someone selling it and despite knowing it was a very simple box, I liked the look of it and decided to grab it, especially since the person selling it was asking for the same price as he'd paid for it direct from Karakuri! 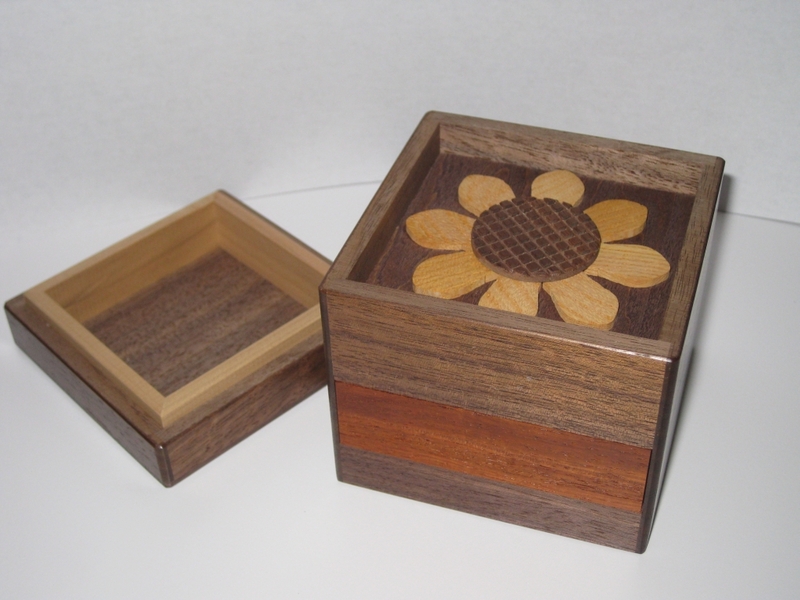 Sunflower, designed and made by Tatsuo Miyamoto initially appears to be a fairly plain box, with a stripe of red wood across one face. 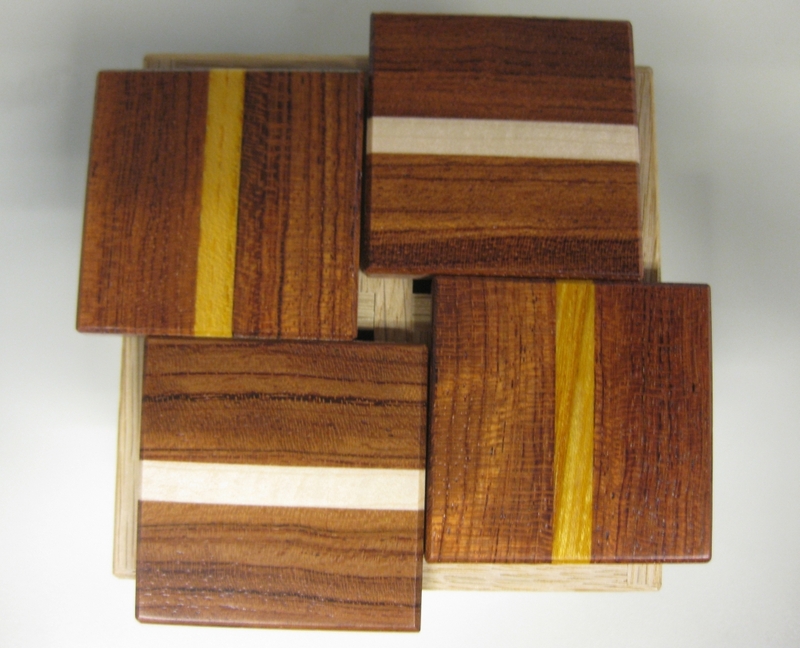 The puzzle measures 7" x 7" x 7.5", made from Walnut, Keyaki, and Karin. With some initial investigation you'll find that the panel on the front will depress slightly, and the base seems to also depress. It won't take much to realise that there's a lid on the box, and removing that you see the reason the box is named Sunflower. I don't want to give away any details about how the box works, other than saying that this is a simple two step box, which despite it's simplicity did put a smile on my face when I opened it for this first time, given the way the mechanism works. My only small issue with the box is that the mechanism is really loose for me. This may have been to ensure that there was enough room for wood expansion, but in my climate it's so lose that it will move on it's own. A little bit of finishing wax added at the right place has easily resolved the issue, so not a big problem, and may be easy to fix up any issues you have on your copy. The second box from this year's Christmas presents and one of those I ordered myself is the Twin 2 from Hideaki Kawashima. I have been very impressed with the style of Kawashima's boxes over the last few years, and really like the simple style of his boxes. 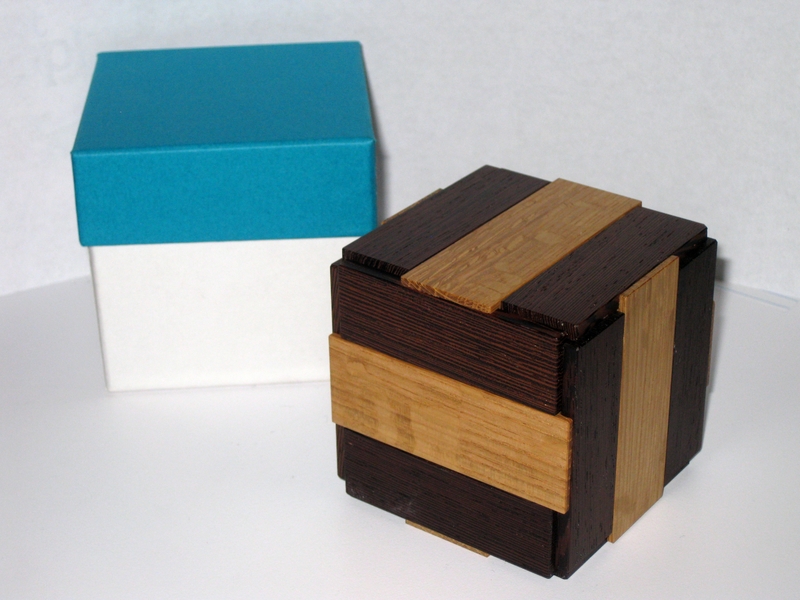 Measuring 3" x 3" x 3" and made from three contrasting woods it's a good looking puzzle, and very similar to some of the previous works he's made. 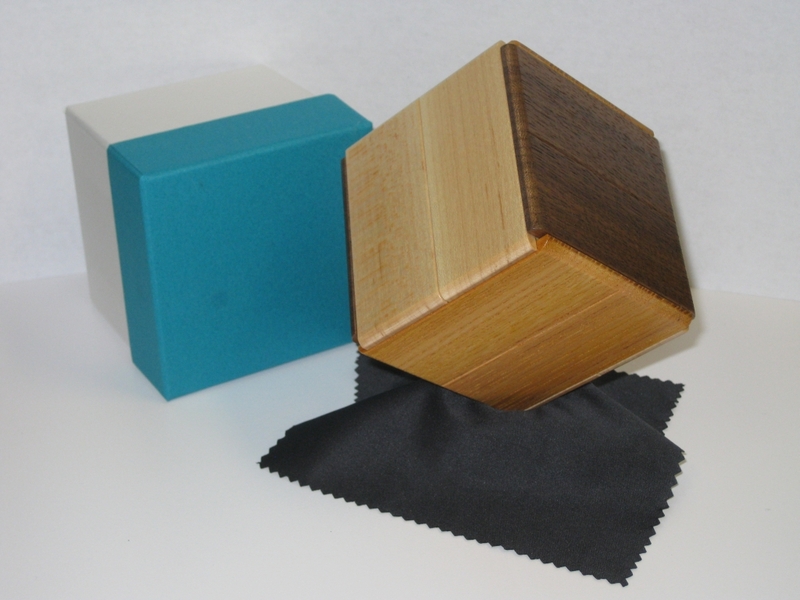 The woods used are Cherry, Maple and Katsura, which gives the puzzle striking contrast between the faces. I'm not going to show any pictures of the puzzle open, as I feel it gives too much away, however this is a really fun puzzle to play with. As you start to investigate the movement in the panels, you'll find a what seems like a spring loaded panel which surely must me useful, and will eventually lead to a discovery on the path to solving the puzzle. With two hidden compartments both of a reasonable size, given the outer dimensions, it's a good box, that really makes the most of the space available. 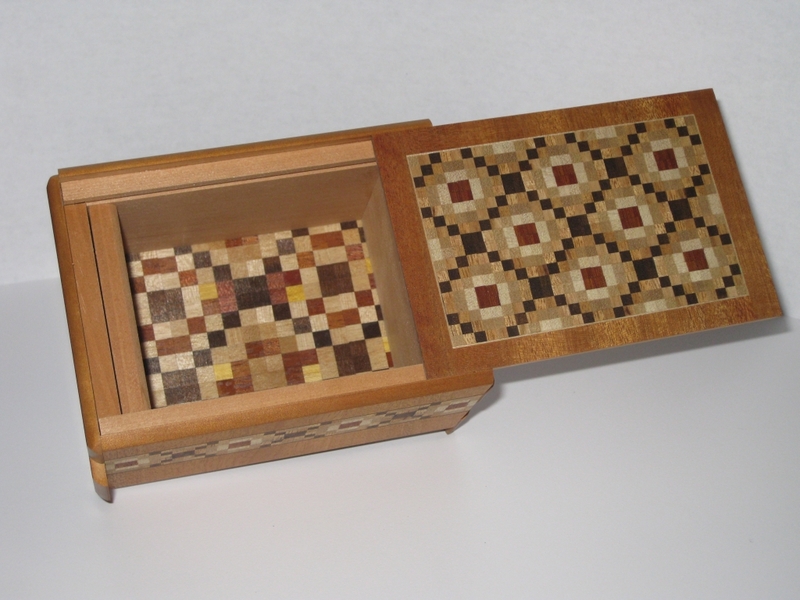 Again, like the Sunflower it's not a challenging box, requiring just 6 steps to open both compartments, however it is a beautifully made box, and great to hand to new puzzle box enthusiasts as it's not too hard and will stand up to some harsh handling. Secret Base 2 was Hiroshi Iwahara's 2011 Christmas Present from the Karakuri Club. I didn't have him as one of my designers last year, but I was fortunate enough to be able to borrow this box to play with. The Secret Base 2 as you might have guessed is based on the original Secret Base puzzle which I've not played with myself, but am aware of how the mechanism works. In this case, I think that partial knowledge may have made my solving of this box more challenging! 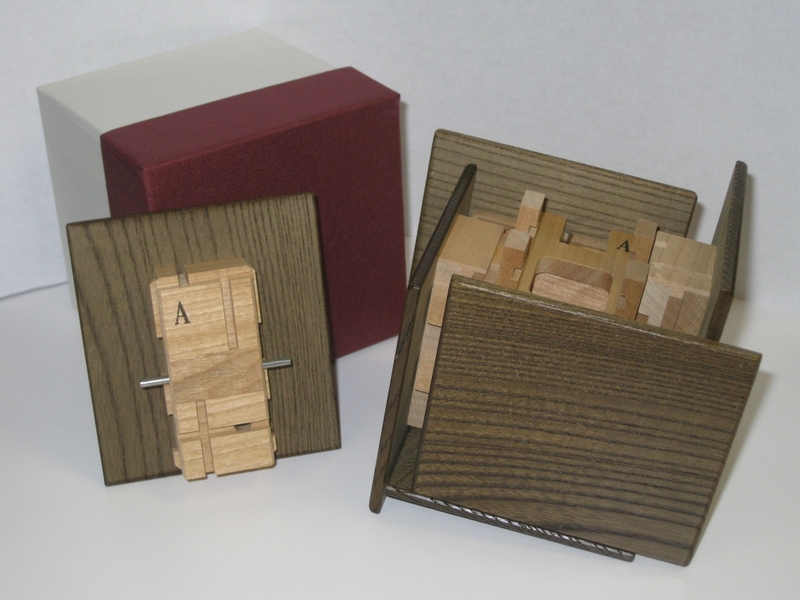 Made from Oak, Walnut, Birch and Bubinga this puzzle measures 3.5" x 3.5" x 3" and is beautifully finished as any Karakuri box is. The mechanism is wonderfully smooth, and the first movement seems almost magical as the pieces slide past each other. It's actually a very difficult puzzle to describe without giving much away. With my knowledge of the original Secret Base, I found the first move fairly quickly, and even the next step didn't take me long to identify. After that however I was a little stumped. The final movement is rather unexpected and quite nicely hidden. I've taken the photo above very carefully to give nothing away about how this opens, but it does at least let you see the movement of the pieces. Once open, there's a reasonable sized space inside and unlike the original Secret Box, there's only one compartment to be found in this puzzle. Overall a nice box with an interesting twist. Well worth picking up a copy. Allard, Brian, Jeff and Michael have all written about it, so head over to their pages to find out what they thought.